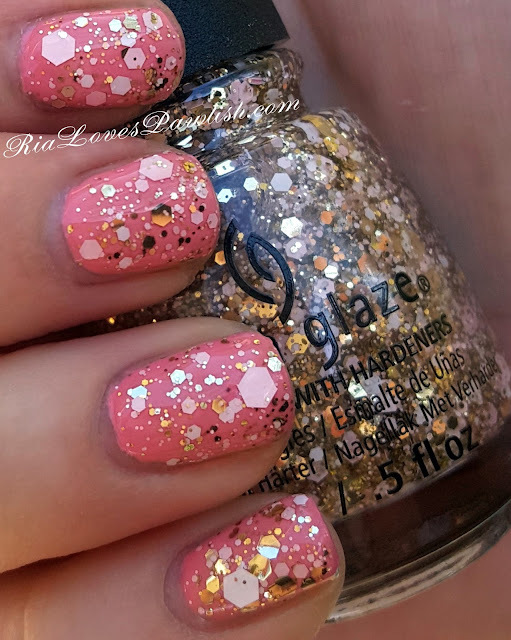 we've come to the two glitters in the China Glaze House of Colour collection, today's is Glitter Me This... (press sample, kindly provided to me for review)! it's a lovely glitter topper with different sized gold and white hex pieces in a clear base. the sizes range from micro-glitter to big ol' chunks! this one does require a bit of placing, and you will absolutely have to place the giant bits. not sure why giant bits are like that, but every polish i've ever used with them acts the same way! i layered it over Pink Or Swim (press sample also from House of Colour) which is a light, warm pink... and i love the combo. as with all glitters, it needs to be sealed with topcoat to make sure all the bits stay in place.